The Lady Bulldog basketball team proved themselves capable several times throughout Tuesday’s bout at Bulldog Pit of hanging with the Class 4A top-ranked Ramettes of Portales. But when all was said and done, the girls in red had shot 50 percent from the field in three out of four quarters. And that’s a stiff pace to match for any squad. The result was a 67-36 defeat that dropped the Artesia girls to 5-6 on the season in their first game of 2018. “The score didn’t look that fantastic, but I thought we played pretty well,” Lady ‘Dog head coach Jeff Houghtaling said today. “Portales is really good. They’re a really good shooting team, and there’s a reason why they’re ranked No. 1 and have only lost two games. 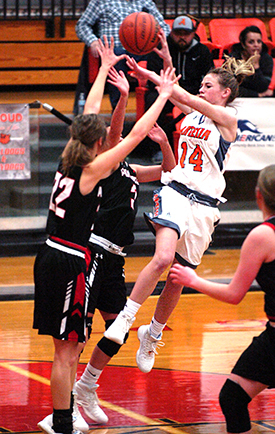 Artesia battled the Ramettes nearly shot for shot through the majority of the opening period Tuesday at the Pit. Stacia Martinez got things started for the Lady Bulldogs with a running jumper, then followed an Alexa Riggs trey with another hard drive to the hoop to keep Artesia within one of Portales, 8-7. They’d stay there by way of a Martinez offensive putback and a free throw apiece from Kali Crandall and Riggs, but a pair of late three’s by Ramettes Lillie Saiz and Codi Flores bumped Portales’ lead to eight going into the second, 19-11. Zamorye Cox kicked off that quarter with yet another trey, and back-to-back buckets inside by Portales’ lofty post Taylee Rippee quickly propelled the Ramettes to a double-digit lead, 26-11. A Gracie Puentes free throw at the 5:31 mark represented the Lady ‘Dogs’ first point of the period, and although they’d pick up their offense from there with baskets from Martinez and Ali Mauritsen, and a pair each from the stripe by Puentes and Brehnan Davis, Artesia remained down by 18 at the break, 38-20. “Defensively, we did a pretty good job of contesting them, they just hit a lot of three’s in the first half and we weren’t able to match that on our end,” said Houghtaling. “I don’t think we played bad defense or anything… they were just hitting their shots. The Lady Bulldogs came out firing in the third quarter, with Kyrah Gonzales following a stop-and-pop by Paityn Houghtaling with a longball and a breakaway layup off the steal to make it 40-27, but from there, the Ramettes would embark on a 10-0 run. A last-second three by Riggs that bounced off the iron before going up and in could only keep Artesia within 20 heading into the final eight minutes, 50-30. Another string of 10 unanswered points by Portales kicked off the fourth, and with the Lady ‘Dogs managing juts a pair of field goals – courtesy of Martinez and Kinli Taylor – a comeback was not in the cards. “We came out in the third quarter with a lot o fire and energy, they had to use a couple timeouts… I felt really good about that, and I thought the girls played hard and did what we asked them to,” Coach Houghtaling said. “We’re just not going to see too many teams that shoot the ball like they do, and we couldn’t match it, but it was a good learning opportunity for us. Martinez finished with 10 points to lead Artesia, followed by Riggs with seven. Rippee posted 20 for the Ramettes and Cox 15. The Lady Bulldogs will now prepare to host another tough opponent at 7 p.m. Friday in Class 6A Clovis before hitting the road west to Deming for a 3:30 p.m. game Saturday against another group of Lady Wildcats. “Clovis is good, but they’re a team Portales beat by 20 also, so I think it’s realistic that if we play well, we have a chance to be real competitive with them,” Coach Houghtaling said. “That’s one team we’ve had on our schedule for years and, since I’ve been coaching, we’ve haven’t been able to beat them. I don’t know if we’re going to do it this year, but it may be a better year for us to have that chance, and I’m pleased we get to play them at home. While Houghtaling would love to see his team get back to .500 against Clovis, their primary focus for the weekend is on their 5A matchup with Deming.